Mangaluru, Dec 14, 2015 : Even six months after the KIADB - Karnataka Industrial Areas Development Board provided all documents required for the registration of 10 acres of land near Konaje allotted to it, the Transport Department is yet to get the same registered in its name and use it. 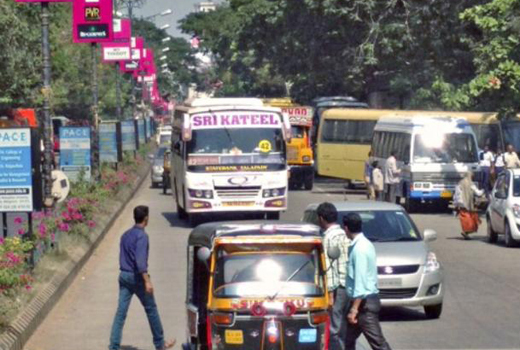 Consequently, the central part of Mangaluru, where the office of the Senior Regional Transport Officer (RTO) and Deputy Commissioner of Transport is located, continues to face traffic gridlocks on every working. Heavy vehicles entering the premises of the RTO on Maidan Road near A.B. Shetty Circle choke vehicular movement even as hundreds of private buses line up in their attempt to move forward towards State Bank Bus Stand. The allotted land is meant to set up vehicle testing centre, driving test track, and also an institute to train people in heavy vehicle driving and maintenance. The activity of testing vehicles before issuing fitness certificates, particularly for heavy vehicles, including trucks and buses, presently being done at the RTO premises, is sought to be shifted to Konaje to decongest the city. Land allocated : In response to a report recently on the RTO facing lack of space to conduct vehicle testing, KIADB has said that possession of 10 acres of land in Site No. 10-C, formed in different survey numbers of Phajeer and Kairangala villages (near Konaje) of Bantwal taluk, has been handed over to the transport department on January 1, 2015. The lease agreement for the same was executed on February 21, while documents required for the registration of the land were provided to the department on August 31. KIADB Assistant Secretary D.V. Swarup Kumar said that it is for the department to get the land registered in its name, while KIADB has performed its part of duty. The allotted land is located in non-SEZ industrial area, behind P.A. College of Engineering. The district administration has been urging the department to shift its activities to the new site. Following complaints of traffic blocks in the recent road safety committee meeting, DK DC Adoor.B. Ibrahim had asked the RTO to take action immediately.